The majority of exoplanets detected so far orbit single stars. Only a few circumbinary planets — planets orbiting two stars — have been discovered to date. Most of these circumbinaries have been detected by NASA’s Kepler mission, which uses the transit method for detection . This newly discovered planet, however, is very unusual. “The exoplanet was observed as a microlensing event in 2007. 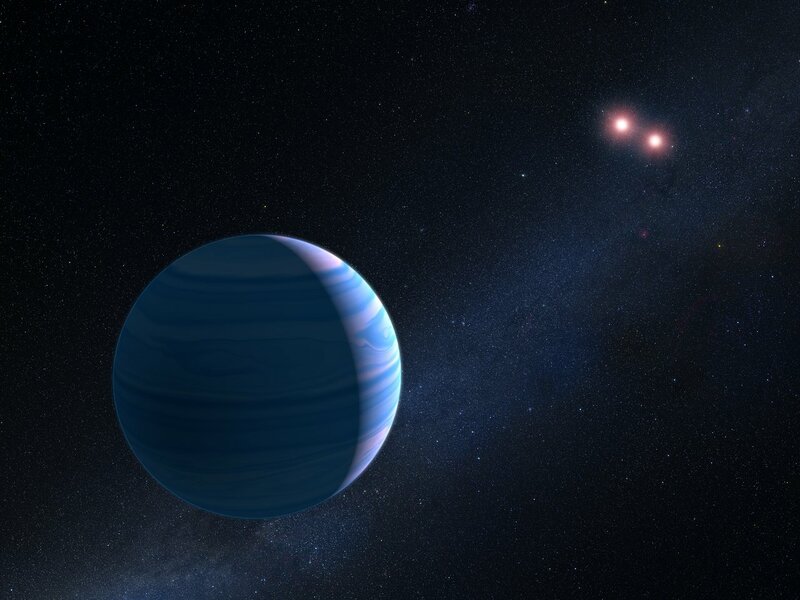 A detailed analysis revealed a third lensing body in addition to the star and planet that were quite obvious from the data,” says David Bennett from the NASA Goddard Space Flight Center, USA, lead author of the study . The event, OGLE-2007-BLG-349, was detected during the Optical Gravitational Lensing Experiment (OGLE) . OGLE searches for and observes effects from small distortions of spacetime, caused by stars and exoplanets, which were predicted by Einstein in his theory of General Relativity. These small distortions are known as microlensing. However, the OGLE observation could not confirm the details of the OGLE-2007-BLG-349 event on its own, especially the nature of the third, unknown lensing body. A number of models could have explained the observed light curve. The additional data from Hubble were essential to enable the scientists to pin down a circumbinary planet as the only possible explanation for both OGLE’s light curve and the Hubble observations. “OGLE has detected over 17 ,000 microlensing events, but this is the first time such an event has been caused by a circumbinary planetary system,” explains Andrzej Udalski from the University of Warsaw, Poland, co-author of the study. This pioneering discovery suggests some intriguing possibilities. While Kepler is more likely to detect planets with small orbits — and indeed all the circumbinary planets it discovered are very close to the lower limit of a stable orbit — microlensing allows planets to be found at distances far from their host stars. “This discovery, suggests we need to rethink our observing strategy when it comes to stellar binary lensing events,” explains Yiannis Tsapras, co-author of the study from the Astronomisches Recheninstitut in Heidelberg, Germany. “This is an exciting new discovery for microlensing”. Now that the team has shown that microlensing can successfully detect events caused by circumbinary planets, Hubble could provide an essential role in this new realm in the continued search for exoplanets. During a transit an exoplanet moves between its parent star and the observer. As a result a small fraction of the star’s light is blocked and the star becomes fainter. See this video for an artist’s impression of a transit. Microlensing is the weakest form of gravitational lensing — the bending of the path of a light ray by some body of mass between a light source and an observer. While strong lensing can lead to multiple images of the same object or to distorted arcs, microlensing causes a change in the brightness of the distant object, caused by the lens. OGLE is a Polish astronomical project that was established in 1992, with the primary intention of investigating dark matter using gravitational microlensing. Several exoplanets have also been discovered by OGLE. While the event was discovered by OGLE other groups and projects contributed as well: MOA (Microlensing Observations in Astrophysics), MicroFUN (Microlensing Follow-Up Network), PLANET (Probing Lensing Anomalies NETwork), and Robonet.